Vanilla beans are more flavorful than vanilla extract, but they also happen to be more expensive. If you don’t want to spend the extra money on vanilla beans, you can usually use vanilla extract instead. Here’s how to get the substitution right. All you need is vanilla extract—make sure it's pure vanilla extract and not the imitation kind. Worried the extra liquid will mess up your recipe? Just dial back one of the other wet ingredients­­ to compensate for the addition of the vanilla extract. You'll find a few different options on the shelf in the baking aisle, when it comes to vanilla extract: pure extract, imitation extract, and vanilla flavoring. "Pure" means that only vanilla beans have been used to make the vanilla flavor; however, that doesn't mean that you won't find other additives, such as sugar on the ingredient list. As you would expect, "Imitation" extract contains artificial vanilla flavoring (vanillin). It's typically derived from wood byproducts. And Vanilla "flavoring" is a combination of these two. Pure vanilla extract is the most expensive option, but it is also the best option when it comes to replacing the flavor of vanilla beans in a recipe. You'd have to use twice as much imitation extract to achieve the right level of flavor, and even then, it wouldn't taste much like vanilla beans. Making your own vanilla extract is one way to save money without sacrificing quality, but that takes you back to the need for vanilla beans. It also requires a considerable time commitment. While vanilla extract is easy to make, it needs to sit for at least two months before it's ready to use. As easy as it is to swap extract for beans, vanilla beans do add a certain something to recipes, whether it be appearance or taste. If you like the look of those little flecks of vanilla seeds­ in your finished recipe, stick with vanilla beans—that’s something extract can’t replicate. Also, consider using vanilla beans, if vanilla is the star ingredient. Beans just pack more punch than extract. 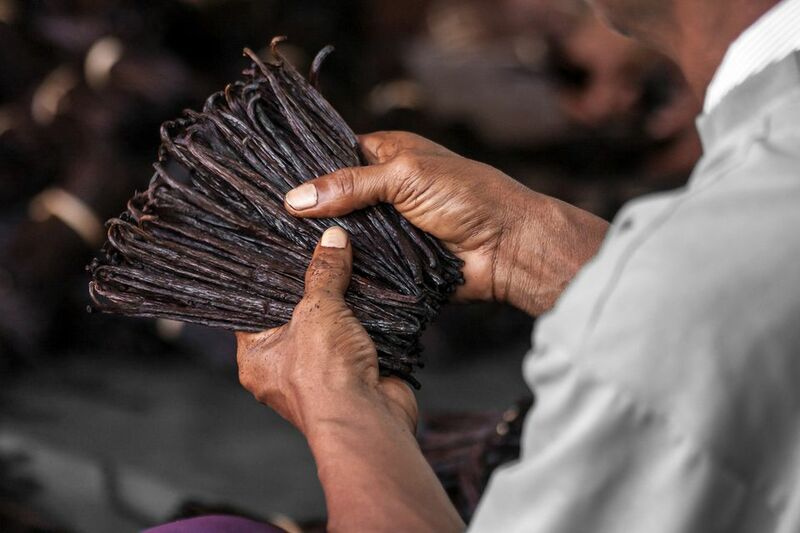 Vanilla is the fruit of the orchid plant, and although there are over 100 varieties of orchid plants, there is only one variety that produces vanilla beans. The process of growing the fruit is labor intensive and very slow. First, the orchid flowers need to be hand-pollinated during a particular month, when the plant is flowering; and it can only be done during a specific time of day when the flower is open. Then, after the beans have been harvested, they have to go through a six-month treatment process, which includes soaking, sweating, drying, and storage. Back in March of 2017, a cyclone hit Madagascar, one of the biggest producers of vanilla beans and wiped out many of the plants. It paired with an overall decline in the number of vanilla plantations caused an already expensive item to become even more expensive. A few years ago, you might have paid as little as $3 for a bean. Now, it's common to pay around $10 a bean. If you're looking for a vanilla bean substitute because you got scared off by the price, consider purchasing vanilla beans online. They're usually considerably cheaper than what you'll pay at a local grocer, and far fresher. Buying in bulk also tends to help bring the cost down. The more you buy; the more you'll save. Vanilla beans should feel moist and flexible, and be highly fragrant. Pass on any that feel dry and brittle. That's a sign that they're old, haven't been stored properly or both. Vanilla beans should be stored in an air-tight container or vacuum-sealed bag until you're ready to use them. It locks in the moisture and flavor, so you get everything you paid for.